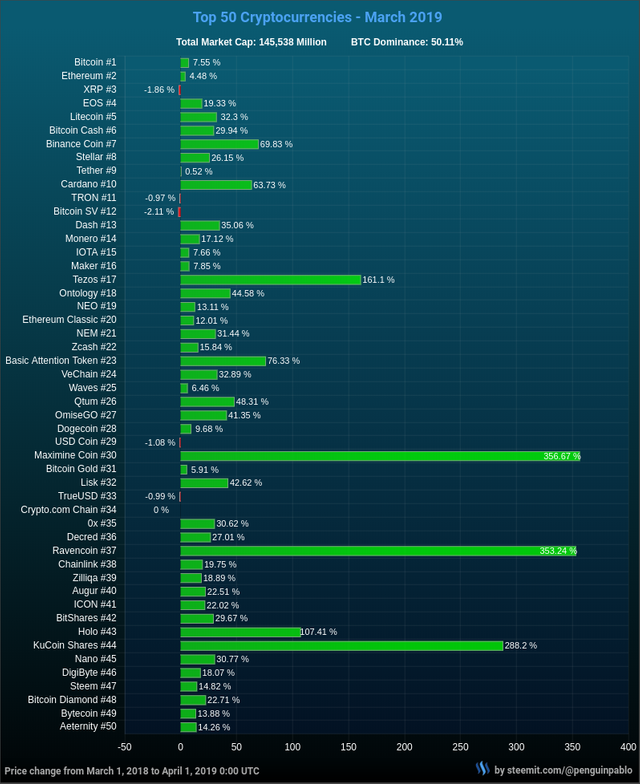 How did the Top 50 cryptocurrencies perform in March 2019? March was a pretty good month for the crypto markets. Almost every cryptocurrency ended in the green while Bitcoin added 7.5% to its price. The total crypto market cap surged from 130.8 billion to 145.5 billion. Altcoins generally performed better than Bitcoin. The Bitcoin dominance went from 52% to 50%. Here is the full overview of last month. How did the Top 50 cryptocurrencies perform in February 2019? How did the Top 50 cryptocurrencies perform in January 2019? How did the Top 50 cryptocurrencies perform in December 2018? How did the Top 50 cryptocurrencies perform in November 2018? How did the Top 50 cryptocurrencies perform in October 2018? How did the Top 50 cryptocurrencies perform in September 2018? How did the Top 50 cryptocurrencies perform in August 2018? How did the Top 50 cryptocurrencies perform in July 2018? How did the Top 50 cryptocurrencies perform in June 2018? How did the Top 50 cryptocurrencies perform in May 2018? How did the Top 50 cryptocurrencies perform in April 2018? How did the Top 50 cryptocurrencies perform in March 2018? How did the Top 50 cryptocurrencies perform in February 2018? January 2018: Was it a Cryptocurrency Bloodbath? How did the Top 50 cryptocurrencies perform in December 2017? How did the Top 50 cryptocurrencies perform in November 2017? Thanks for this report, March was really good for crypto currencies but we’ll to see a better April. What is tezos? Never heard. Interesting to see relatively new assets on the list with huge gains!